We’ve thus far met the largest and smallest of the macaws (please see Part I and II of this article). Today I’d like to cover a few that, while considered to be “miniatures” in the macaw world, are still quite substantial birds, and not at all small in character. At 15-20 inches in length, the following birds are comparable in size to an Amazon parrot, but more thinly built. Along with the noble macaw (please see Part I of this article), they are excellent choices for those new to macaw keeping. All have the intelligence and spirit of their larger relatives, but are easier to manage and a bit calmer in general (and less expensive!). Most adjust well to cage life if taken out for frequent exercise. The cage provided should, however, be larger than one might choose for a similarly-sized Amazon – something along the lines of an A&E Dometop Birdcage, or if possible, a larger macaw cage, would be ideal. This charming bird’s unfortunate Latin name conjures up the image of a stern creature, which is not at all accurate. The largest of the “miniature macaws”, the 20 inch long severe is playful, affectionate and a potentially skilled talker. Like all macaws, a tame severe enjoys physical contact, but will still occasionally put you to the test by trying to establish dominance. However, it is not nearly as strong-willed as the larger macaws, and usually makes a fine pet. Severe macaws are emerald green with a blue cast to the head and outer wings. The underside of the flight feathers and tail is a startling reddish-orange. Their large range extends from eastern Panama to French Guiana and south to northern Bolivia and central Brazil. Severe macaws are nearly always associated with forested swamps and wooded river floodplains. Image referenced from Wikipedia. This little beauty reaches only 15 inches in length. 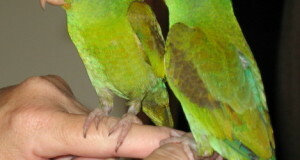 It is clad in dark green, with a black forehead and a yellow collar about the base of the neck; streaks of blue mark the tail and wing feathers. Yellow-collared macaws are well known for their harsh, high-pitched screeches, but more than compensate for this by being among the most personable of the group. Often described as “clownish”, they do indeed have a way of keeping one amused. Those I have worked with were tireless in their efforts to explore and manipulate everyone and everything around them, and friends echo this observation. In common with their relatives, yellow-collared macaws need a great deal of contact and interaction if they are to remain friendly. Very much a bird of swampy forests and wooded riversides, the yellow-collared macaw dwells in the center of South America – eastern Bolivia, Paraguay, northwestern Argentina and central Brazil. Field observations indicate that it may be even more gregarious than other macaws, with flocks numbering 400-500 birds occasionally reported. It is also said that, in contrast to other macaws, pairs of yellow-collards are not always evident within the flock (pairs of macaws usually stay in close physical proximity to one another, even within a large flocks, and are usually easy to distinguish). Image referenced from Wikipedia. Midway between the 2 preceding birds in size, the beautiful 17 inch long Illiger’s macaw also differs from them in color, being more of an olive than emerald green. It has a red forehead, blue-green head, blue and green wings and a patch of red on the belly and lower back. This macaw is very amenable to handling, and tames readily. Alert and active it is, like all macaws, curious and prone to getting into mischief if left out of the cage unsupervised. It is often described in books as “moody”…but I’m not sure how that label arose, as it seems to me no more prone to mood swings than other parrots (or most people!). The range of the Illiger’s macaw is now only a fraction of what it once was. Today, this bird is known only from eastern Brazil, Paraguay and northeastern Argentina – and is considered threatened in each of these countries. They are particularly scarce in Paraguay, but happily are bred in abundance in captivity. Most often encountered in pairs or small flocks, Illiger’s macaws keep to forests and forest edges near lakes, swamps and rivers. Image referenced from Wikipedia.